It's about 2002, I'm just about to stop being a teenager, get a job, and work for a living as highschool has pretty much come to an end. A super warm and sunday day, miracles for Canada I know, have made us run from swimming outside into the house as a thunderstorm rolled in and chilled the air. Huddled in my room with my brother Marc, my friend Louis and one of my best friends Chris, I continue playing Resident Evil 2. I'm in an interrogation room. It's quiet. I've been here a hundred times and I'm not even sure what brought me back. A Licker jumps through the window. I scream and there's nothing dignified about it. Fast forward to today and Resident Evil 2 is back and holy hell did I jump, curse, and try to not scream and all we got was a thirty minute timed demo. I'm. So. SCREWED. For anyone that has been following me specifically, you know that I do not do horror. At all. So what did I do the second that Capcom released a timmed one shot demo of their newest re-creation? I streamed it on Twitch in which both Richard and Robert jumped in as my peanut gallery and you know what? The revamp is terrifying. The graphics are stellar and it only makes it worse. But let's start at the beginning shall we? The massive outbreaks of the Resident Evil universe have just begun to happen. Starting his first day on the job, Leon S. Kennedy is forced to take refuge in the precinct that he was assigned to. With nothing more than his service pistol, he starts to look around his environment as he can't stay there forever. 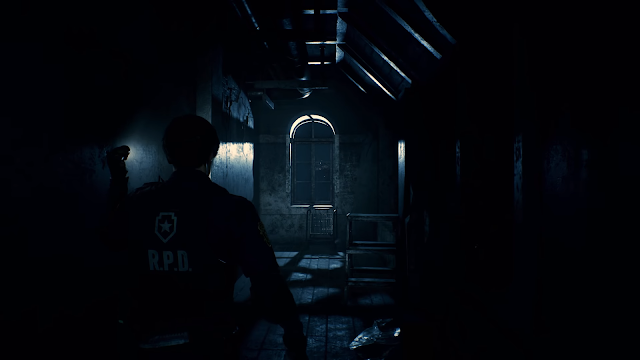 Resident Evil 2: 1-Shot Demo is currently available on all platforms until the 31st and it provides a timed thirty minute look into the game. Do you walk around slowly? Do you rush through to see how far you can make it? Or do you find some middle ground? Thinking of how to proceed I simply went in and figured I'll get as far as I can get with the thirty minutes. Needless to say, I got scared shitless. While I have yet to play Resident Evil 7, I may crown this remake the most terrifying yet. Graphically on the PS4 the level of detail was impressive. The character models, the zombies and the environment. It's clean and cripst and it helps to add that level of atmosphere to make it all the worse to walk through in the dark. Now this is a zombie game. You shoot zombies. Generally in the head for massive damage. They generally are supposed to "die" especially when you see parts of their heads flying. Did they though? In this case they didn't making you wonder exactly what Capcom was thinking when they let "dead" zombies get back up. Lots of ammo was wasted on this and when it came to a knife to get into close quarters combat? Well let's just say that I was too preoccupied with trying not to die that I didn't even notice that my knife was no longer in my hands but instead sticking out of the zombie's chest. This was a great level of detail however… could I keep my melee weapons in my hands? This was terrifying enough as is.